Destoryit 2240CC is a perfect desk-side personal shredder. Feed Opening: 8 - 3/4"
Cut Size: 1/8" x 1"
- Feed opening: 9 1/2"
- Cut size: 3/32" x 5/8"
- Feed opening: 10 1/4"
- Cut size: 3/16" x 1 1/2" or 3/32" x 5/8"
Destroyit 2240CC Cross Cut Paper Shredder is ideal for offices, homes and small work places. 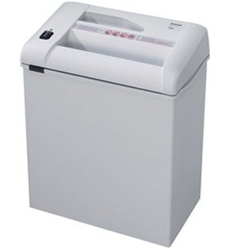 It gives cross paper shredding while featuring transparent safety shield in the feed opening, double protection against overheating and durable gears enclosed in dust-proof housing. This shredder also shreds staples and paper clips. The MBM Destroyit 2240CC Cross Cut is a perfect desk-side shredder and is totally affordable because of its cost benefits. Cut Size 1/8" x 1"
Dimension 8 1/2" x 13 1/2" x 17 3/4"